It is a big mistake to think picture books are for young children. 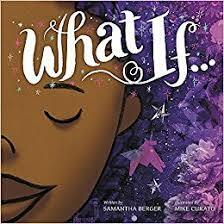 Certainly that is the case with Samantha Berger’s What If. . . . Illustrated in glorious variety by Mike Curato, What If… is a celebration of imagination that can inspire young and old. The story is a simple one, told by a young girl who likes to make art “to create many stories that come from my heart.” She imagines what she’d do if her drawing pencil disappeared. No problem, she’d fold the paper until stories appeared! The book continues, envisioning what she’d do as each potential source of expression vanished: carve her chair, draw in the dirt, arrange the leaves, shape the shadows. And, in the end, if all else vanished, she could use her mind to imagine stories of all varieties. What If. . . reminds all of us of the flexibility and power of the creative spirit, both through the young heroine’s determination and through the varied materials used in the illustrations. The lessons are made even more real by the author’s and illustrator’s notes describing the circumstances that led to the story. The author’s first draft began when her apartment flooded, leaving her mid-project with no art materials. Like the book’s narrator, she had to find art in the things around her. 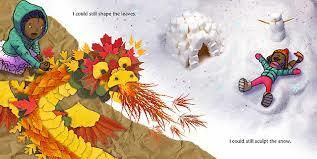 This, in turn, inspired the use of found objects in the book’s illustrations. What If … made me want to experiment, and has me looking at the clutter of our house as potential art material. It could also be used as a writing exercise for early readers, imagining other ways they could make art. Perhaps most importantly, it is a good reminder of the power of imagination, and a way to share that reminder with students. When they know you see the potential power in their ideas, they may begin to see it, too.